Many talented crew members contributed to the success of Elliott Racing and Melling Racing during their successful tenure in NASCAR throughout the 1980s and 1990s. Each of them were honored to work alongside NASCAR legends George, Ernie, Dan and Bill Elliott and contributed to their storied dynasty. 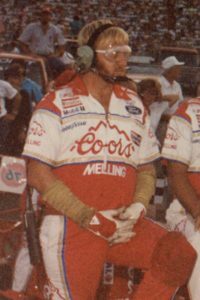 One of those was Mike Rich, a rear tire changer that lost his life in a pit road accident during the season finale at Atlanta International Raceway on Nov. 18, 1990. The crash occurred as Ricky Rudd slowed to enter his pit stall during a caution on lap 300 of the 328-lap race. The brakes on Rudd’s Chevrolet locked, sending him spinning into the right-rear of Elliott’s car where Rich was changing the tire. Dan, as well as teammate Tommy Cole, were hit by Rudd’s Chevrolet. Cole was in and out of consciousness but remembered ESPN broadcaster Dr. Jerry Punch asking him if he was alright. “All cameras were on us because we were leading the race,” Cole said. “I had just pushed down on the jack handle and it happened. There’s a shot of my headphones and hat about two feet above my head. For some reason or another, I can remember hearing Bill say, ‘I think Tommy is hurt. Check on him.’ But how did I hear that if my headphones got knocked off my head? I haven’t figured that out yet. Rich was not as fortunate as Cole, having suffered fatal injuries after being pinned between Elliott’s Ford and Rudd’s Chevrolet. At the time of the accident, Rich was so focused on changing the right-rear tire that he didn’t see Rudd spinning out of control behind him. Rich’s tenure with Melling Racing began in the late-1980s when the team was looking to fill crew member positions on the team. The Blairsville, Ga. resident operated his own grading business when he wasn’t traveling the country during race weekends. His work outdoors with a variety of landscaping jobs proved beneficial for wrestling heavy race tires and wheels on and off of rear spindles. He proved to be one of the best in the business each time Bill wheeled their No. 9 Fords in for service. Charles Palmer, a general mechanic for Melling Racing, remembered his close friend as a loyal employee that gave his all to the job at hand during every stop. Mike Brandt, gas man for Melling Racing in the late 1980s, remembered Rich as dedication to doing the job right. Gerald “Bug” Swafford, Melling Racing’s transporter driver and windshield cleaner during pit stops, enjoyed Rich’s pleasant personality. Within a display honoring the Elliott family at the Georgia Racing Hall of Fame hangs one of Rich’s Melling Racing crew shirts and a photo taken during the 1990 season. Race fans as well as many within racing circles feel he should be inducted into the hall among Georgia’s greatest racers. “I think Mike absolutely deserves to be in there,” Bill said. “He gave it his all and at the end of the day, he gave his life for what he was doing. How do you ask anyone to do more than that? As a direct result of the accident at Atlanta, pit road speed limits were implemented in 1991. Over time, mandatory helmets and fire proof uniforms followed and as of 2018, fewer crew members are allowed to go over the wall during pit stops. Mike Helton, NASCAR’s vice chairman, was general manager of Atlanta International Raceway in the mid-1980s. During that time, the Bristol, Tenn. native became good friends with the Elliott family. “I was running the Atlanta track while the Elliott clan was developing and got to know Bill and Ernie and Dan Elliott,” Helton said. “A lot of their crew guys were really unique individuals of their own and Mike was certainly one of those. I watched him develop and become more competitive. All of their personalities were down to earth. As a result of Rich’s death, NASCAR officials and many Cup series team owners, such as Junior Johnson and Bud Moore, came up with a rules package for 1991 that would keep all crew members safe on pit road. NASCAR’s first plan was to use odd and even decals on race car windshields to determine when drivers would make pit stops. The concept proved confusing and difficult for fans to understand. 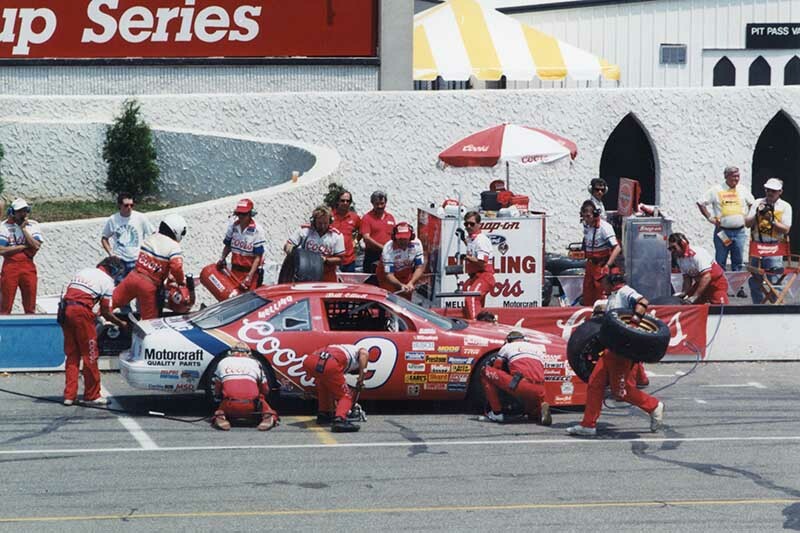 A second idea to regulate pit road speeds actually came to fruition through previous use in special race formats such as the All-Star events at Charlotte Motor Speedway. Pit road speeds were implemented in the Winston Cup Series beginning at North Wilkesboro Speedway in April of 1991. Helton was working with Talladega Superspeedway at that time but was a big part of those conversations. “We knew we were going to change the dynamics of pit road,” Helton said. “The overwhelming desire to make it safer won out at the end of the day. Rich will always be remembered as a dedicated racer that worked hard to perform his duties to the very best of his ability.